Download "University of Pittsburgh. 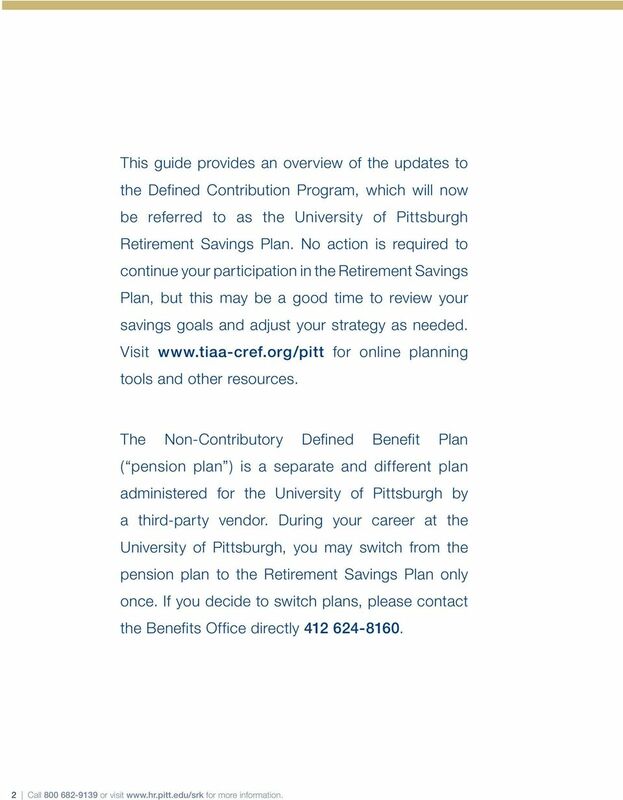 Your guide to the University of Pittsburgh Retirement Savings Plan updates"
2 This guide provides an overview of the updates to the Defined Contribution Program, which will now be referred to as the University of Pittsburgh Retirement Savings Plan. No action is required to continue your participation in the Retirement Savings Plan, but this may be a good time to review your savings goals and adjust your strategy as needed. Visit for online planning tools and other resources. The Non-Contributory Defined Benefit Plan ( pension plan ) is a separate and different plan administered for the University of Pittsburgh by a third-party vendor. During your career at the University of Pittsburgh, you may switch from the pension plan to the Retirement Savings Plan only once. If you decide to switch plans, please contact the Benefits Office directly Call or visit for more information. 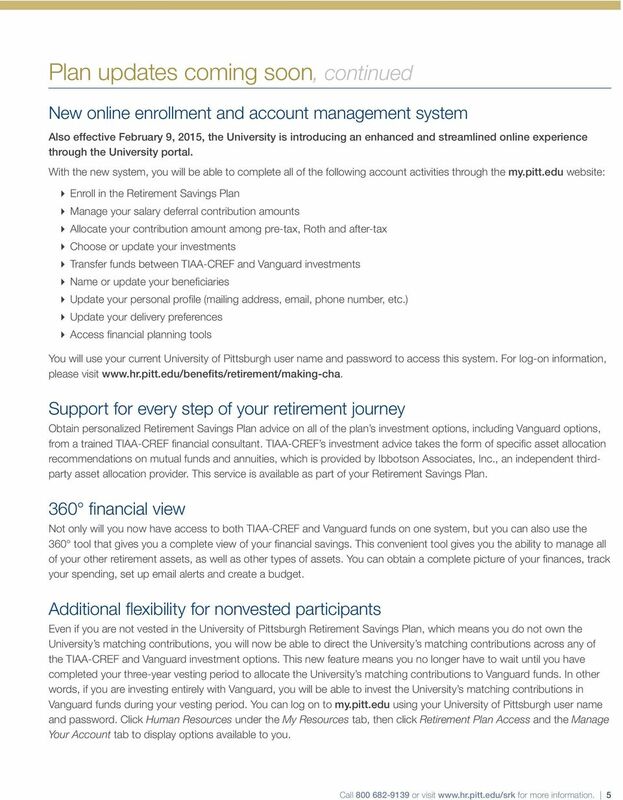 4 Plan updates coming soon Working with TIAA-CREF and Vanguard, the University of Pittsburgh is committed to offering you the services you need to pursue the retirement you want and deserve. 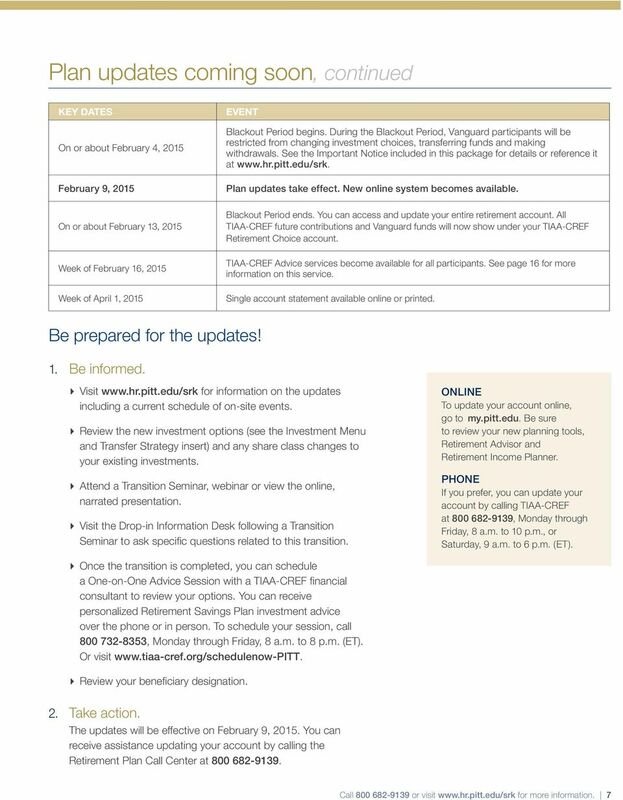 Starting on February 9, 2015, important updates are coming to the University of Pittsburgh Retirement Savings Plan. Please note that these changes do not apply to the University s Non-Contributory Defined Benefit Plan ( pension plan ). 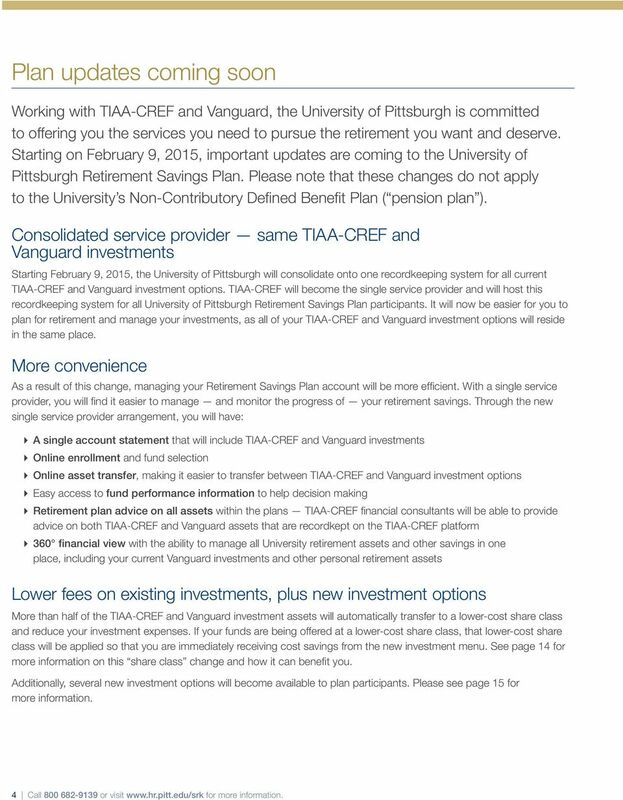 Consolidated service provider same TIAA-CREF and Vanguard investments Starting February 9, 2015, the University of Pittsburgh will consolidate onto one recordkeeping system for all current TIAA-CREF and Vanguard investment options. 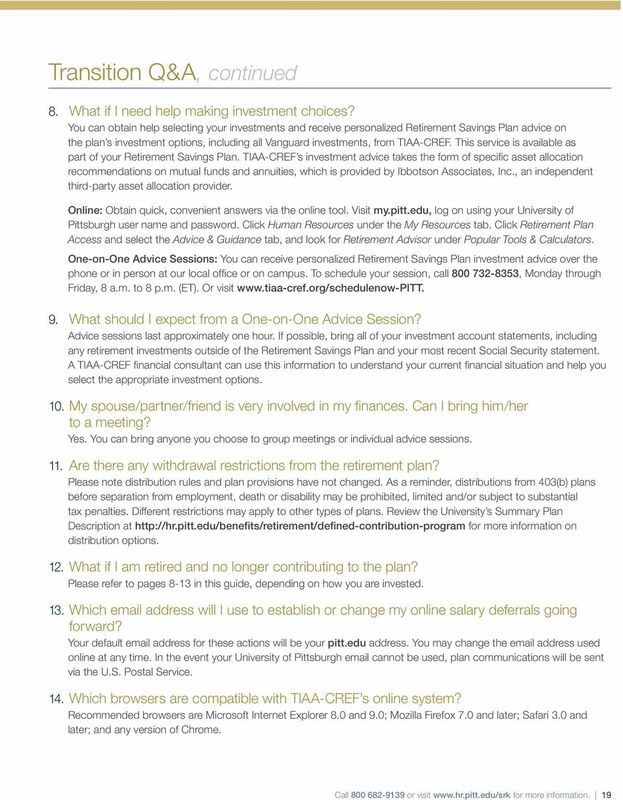 TIAA-CREF will become the single service provider and will host this recordkeeping system for all University of Pittsburgh Retirement Savings Plan participants. It will now be easier for you to plan for retirement and manage your investments, as all of your TIAA-CREF and Vanguard investment options will reside in the same place. More convenience As a result of this change, managing your Retirement Savings Plan account will be more efficient. With a single service provider, you will find it easier to manage and monitor the progress of your retirement savings. Through the new single service provider arrangement, you will have: A single account statement that will include TIAA-CREF and Vanguard investments Online enrollment and fund selection Online asset transfer, making it easier to transfer between TIAA-CREF and Vanguard investment options Easy access to fund performance information to help decision making Retirement plan advice on all assets within the plans TIAA-CREF financial consultants will be able to provide advice on both TIAA-CREF and Vanguard assets that are recordkept on the TIAA-CREF platform 360 financial view with the ability to manage all University retirement assets and other savings in one place, including your current Vanguard investments and other personal retirement assets Lower fees on existing investments, plus new investment options More than half of the TIAA-CREF and Vanguard investment assets will automatically transfer to a lower-cost share class and reduce your investment expenses. If your funds are being offered at a lower-cost share class, that lower-cost share class will be applied so that you are immediately receiving cost savings from the new investment menu. 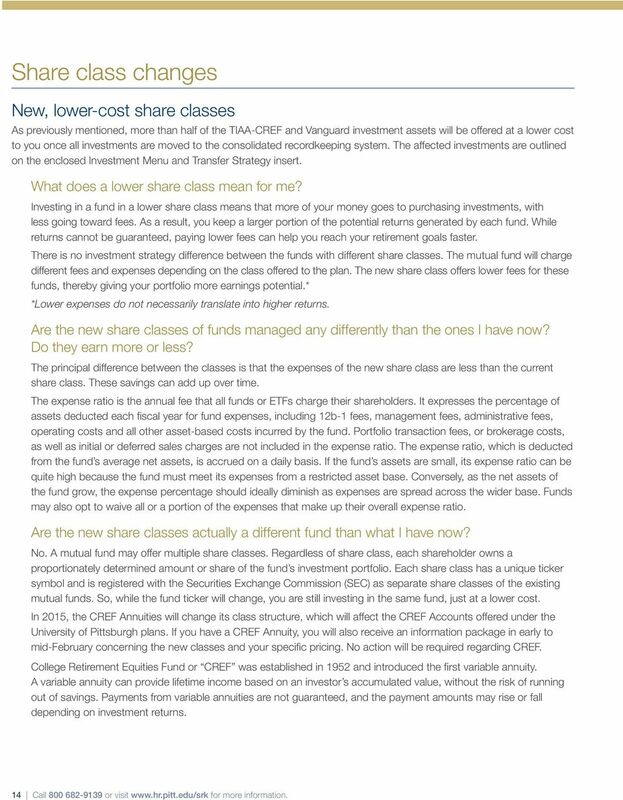 See page 14 for more information on this share class change and how it can benefit you. Additionally, several new investment options will become available to plan participants. Please see page 15 for more information. 4 Call or visit for more information. 6 Plan updates coming soon, continued A new Retirement Choice account that will hold both TIAA-CREF and Vanguard investments As a part of the changes, new accounts (contracts) will be opened for all existing TIAA-CREF and Vanguard participants for contributions made after February 9, The new accounts are called Retirement Choice contracts. Your contributions, beginning February 9, 2015, will go into this new contract. Existing balances will remain where they are in your current contracts unless you decide to move them once the transition is complete. 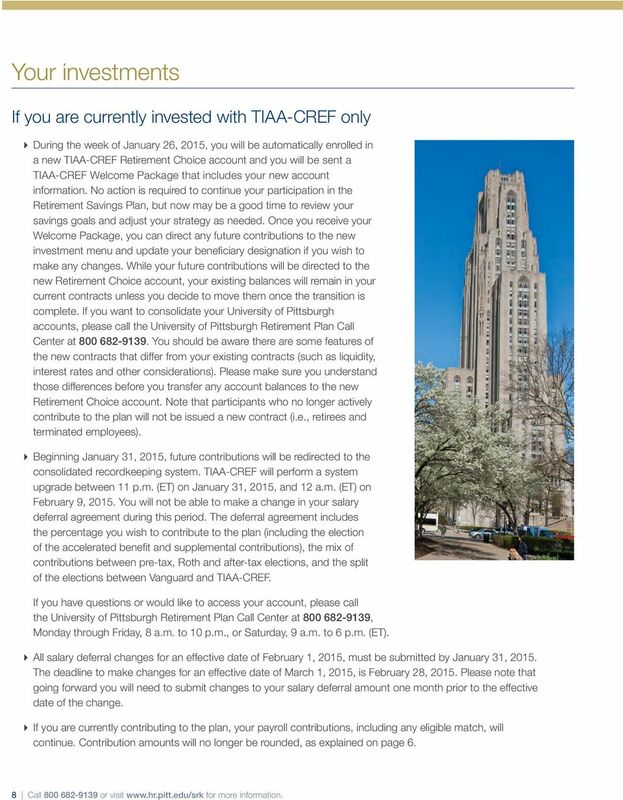 If you want to consolidate your University of Pittsburgh accounts, please call the University of Pittsburgh Retirement Plan Call Center at Please see the TIAA and CREF Annuity Contract Comparison Chart on page 22 for more information. Your contributions to the Supplemental plan Today, if you invest in the University of Pittsburgh unmatched supplemental plan, you can elect contribution amounts in a flat dollar amount or as a percentage of your salary. Using a percentage of salary for contributions better supports a robust savings plan, allowing for additional contributions with salary increases. Therefore, beginning February 9, 2015, only a percentage of your salary will be permitted as your contribution amount allowing for additional contributions with salary increases. If you are currently contributing a flat dollar amount, that amount will be converted to a percentage of your salary, and that percentage amount will be rounded up or down to the nearest two decimal places. For example, if you are currently contributing $100 per pay period and your monthly base salary is $3,000, your $100 contribution will be converted to 3.33%. With a percentage as your contribution amount, your retirement contributions follow changes in your salary. If you change this percentage in the future, please note only whole percentage contribution amounts will be available going forward. If you are affected by this conversion, you will receive a separate letter in the coming weeks with more information. Rounding rules for contribution amounts Your current percentage contribution amounts directed to the 403(b) plan will now be calculated to two decimal places for purposes of computing your contribution amount. For example, today if you are contributing 5% of your salary and that equals $ per pay period, that amount is rounded up to the next whole dollar amount of $111. Beginning February 9, 2015, your contribution amount will be exactly $110.86, which represents 5% of your salary. Here is what to expect: KEY DATES Beginning January 26, 2015 Week of January 26, 2015 EVENT On-site Transition Seminars and Drop-in Information Desks will begin. This will allow you to ask specific questions directly to a financial consultant. Please reference the enclosed Event Schedule for details. Welcome Package is sent to you that includes your new account information. Please review your investment options and beneficiary elections. If you have questions about these elections, please contact the Retirement Plan Call Center at January 31 through February 9, 2015 TIAA-CREF will perform a system upgrade between 11 p.m. (ET) on January 31, 2015, and 12 a.m. (ET) on February 9, In preparation of this upgrade, you will not be able to make a change in your salary deferral agreement during this period. 6 Call or visit for more information. 8 Your investments If you are currently invested with TIAA-CREF only During the week of January 26, 2015, you will be automatically enrolled in a new TIAA-CREF Retirement Choice account and you will be sent a TIAA-CREF Welcome Package that includes your new account information. No action is required to continue your participation in the Retirement Savings Plan, but now may be a good time to review your savings goals and adjust your strategy as needed. Once you receive your Welcome Package, you can direct any future contributions to the new investment menu and update your beneficiary designation if you wish to make any changes. While your future contributions will be directed to the new Retirement Choice account, your existing balances will remain in your current contracts unless you decide to move them once the transition is complete. If you want to consolidate your University of Pittsburgh accounts, please call the University of Pittsburgh Retirement Plan Call Center at You should be aware there are some features of the new contracts that differ from your existing contracts (such as liquidity, interest rates and other considerations). Please make sure you understand those differences before you transfer any account balances to the new Retirement Choice account. Note that participants who no longer actively contribute to the plan will not be issued a new contract (i.e., retirees and terminated employees). Beginning January 31, 2015, future contributions will be redirected to the consolidated recordkeeping system. TIAA-CREF will perform a system upgrade between 11 p.m. (ET) on January 31, 2015, and 12 a.m. (ET) on February 9, You will not be able to make a change in your salary deferral agreement during this period. 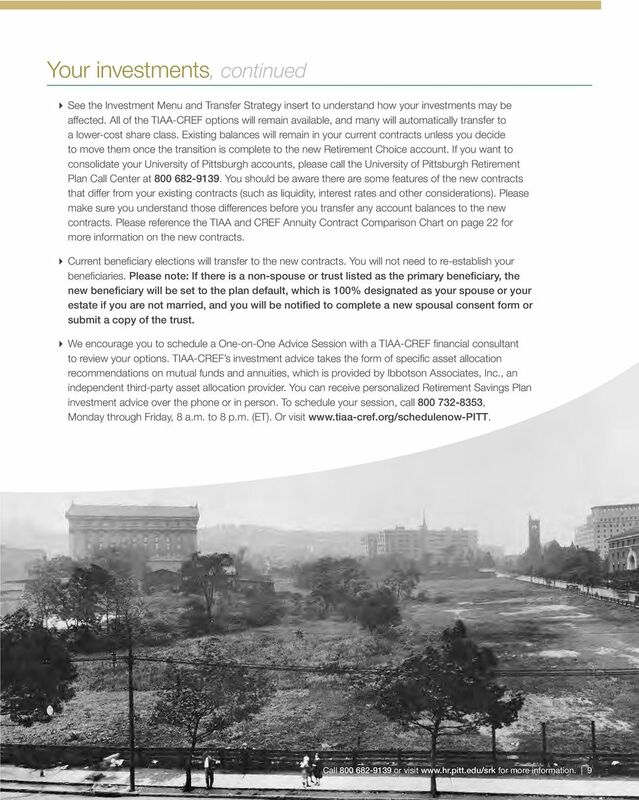 The deferral agreement includes the percentage you wish to contribute to the plan (including the election of the accelerated benefit and supplemental contributions), the mix of contributions between pre-tax, Roth and after-tax elections, and the split of the elections between Vanguard and TIAA-CREF. If you have questions or would like to access your account, please call the University of Pittsburgh Retirement Plan Call Center at , Monday through Friday, 8 a.m. to 10 p.m., or Saturday, 9 a.m. to 6 p.m. (ET). All salary deferral changes for an effective date of February 1, 2015, must be submitted by January 31, The deadline to make changes for an effective date of March 1, 2015, is February 28, Please note that going forward you will need to submit changes to your salary deferral amount one month prior to the effective date of the change. If you are currently contributing to the plan, your payroll contributions, including any eligible match, will continue. Contribution amounts will no longer be rounded, as explained on page 6. 8 Call or visit for more information. 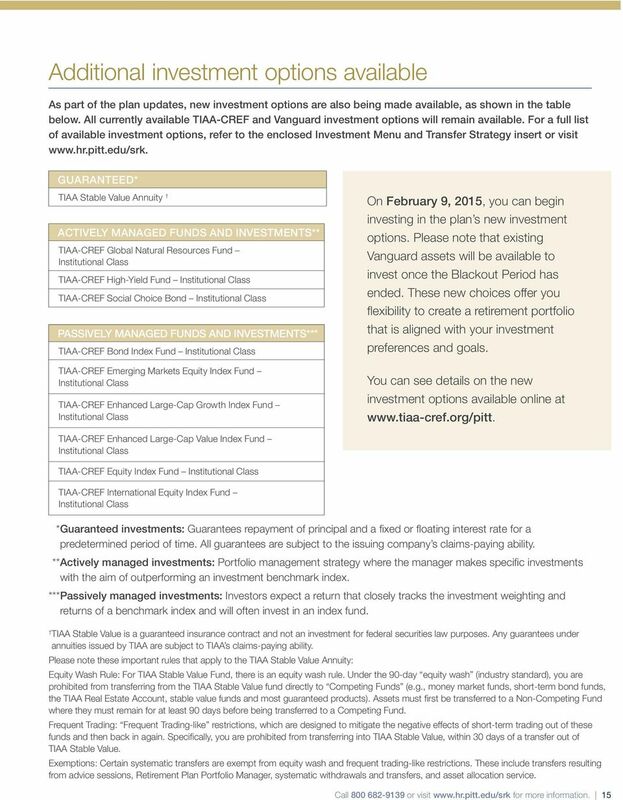 10 Your investments, continued If you are currently invested with Vanguard only During the week of January 26, 2015, you will be automatically enrolled in a new TIAA-CREF Retirement Choice account and you will be sent a TIAA CREF Welcome Package that includes your new account information. Note that participants no longer actively contributing to the plan will still be issued a new contract for their Vanguard accumulations only. During the Blackout Period, beginning on or about February 4, 2015, future contributions and existing assets will be redirected to the consolidated recordkeeping system. No action is required to continue your participation in the Retirement Savings Plan, and your Vanguard investments will be part of the consolidated lineup. You will be unable to change your investment choices, transfer funds, initiate withdrawals or change your salary deferral amount during this period. For details, see the Blackout Notice included in this package or refer to it at TIAA-CREF will perform a system upgrade between 11 p.m. (ET) on January 31, 2015, and 12 a.m. (ET) on February 9, You will not be able to make a change in your salary deferral agreement during this period. The deferral agreement includes the percentage you wish to contribute to the plan (including the election of the accelerated benefit and supplemental contributions), the mix of contributions between pre-tax, Roth and after-tax elections, and the split of the elections between Vanguard and TIAA-CREF. For more information or if you have questions, please call the University of Pittsburgh Retirement Plan Call Center at , Monday through Friday, 8 a.m. to 10 p.m., or Saturday, 9 a.m. to 6 p.m. (ET). All salary deferral changes for an effective date of February 1, 2015, must be submitted by January 31, The deadline to make changes to your contributions for an effective date of March 1, 2015, is February 28, If you are currently contributing to the plan, your payroll contributions, including any eligible match, will continue. Contribution amounts will no longer be rounded, as explained on page 6. 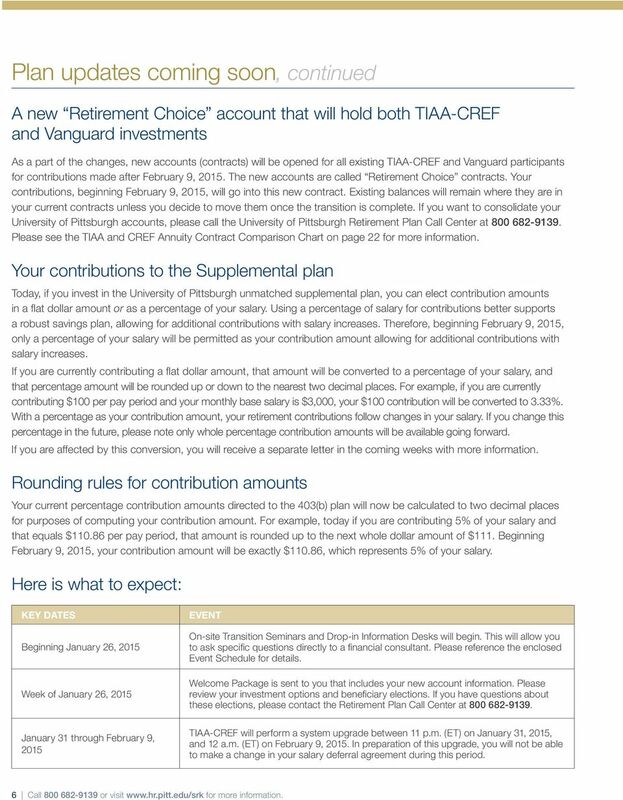 Beginning February 9, 2015, your existing assets and any future contributions to the University of Pittsburgh Retirement Savings Plan will be redirected from Vanguard to the new investment options. 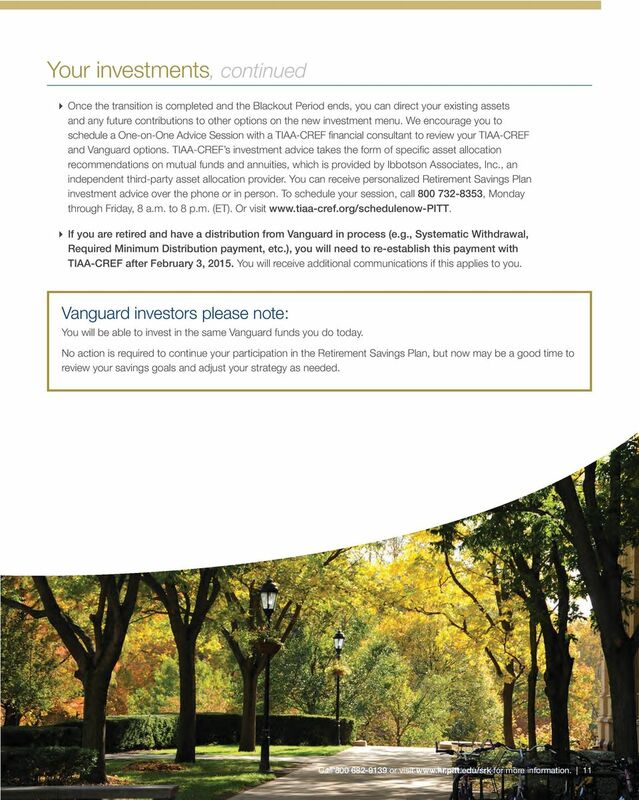 Current Vanguard funds that you own will remain fully invested during the transition and will be moved to the same Vanguard fund held on the TIAA-CREF platform. In some instances, they may be moved to a lower-cost share class. See the Investment Menu and Transfer Strategy insert to understand how your investments may be affected. Current beneficiary elections will transfer to the new contracts. You will not need to re-establish your beneficiaries. Please note: If there is a non-spouse or trust listed as the primary beneficiary, the new beneficiary will be set to the plan default, which is 100% designated as your spouse or your estate if you are not married, and you will be notified to complete a new spousal consent form or submit a copy of the trust. 10 Call or visit for more information. 12 Your investments, continued If you are currently contributing to both TIAA CREF and Vanguard Your investment elections for future contributions will be blended based upon your current deferral rates and investment elections with TIAA-CREF and Vanguard. In the following example, 50% of your contributions are going to TIAA-CREF and 50% are going to Vanguard. Within your TIAA-CREF contribution, you currently have allocated 50% to TIAA-CREF Fund 1 and 50% to TIAA CREF Fund 2. Within your Vanguard contribution, you currently have allocated 80% to Vanguard Fund A and 20% to Vanguard Fund B. Upon the transfer to the TIAA-CREF platform, your total fund allocation will be as shown in the chart at the right. Your allocations remain the same, but TIAA CREF and Vanguard are simply combined to equal 100%. 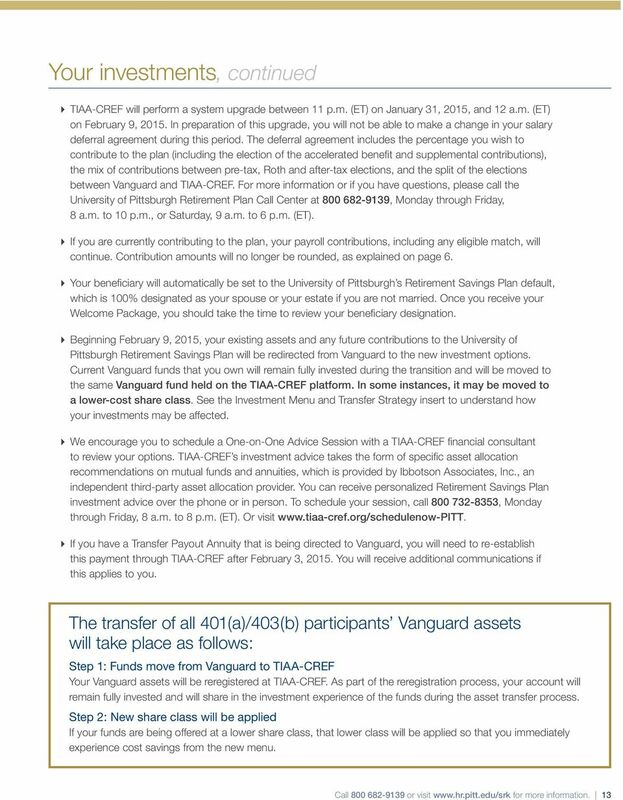 Before the transfer: 50% TIAA-CREF Fund 1 50% TIAA-CREF Fund 2 80% Vanguard Fund A 20% Vanguard Fund B 50% 50% After the transfer: TIAA-CREF Fund 1 = 25% TIAA-CREF Fund 2 = 25% Vanguard Fund A = 40% Vanguard Fund B = 10% During the week of January 26, 2015, you will be automatically enrolled in a new TIAA-CREF Retirement Choice account and you will be sent a TIAA-CREF Welcome Package that includes your new account information. No action is required to continue your participation in the Retirement Savings Plan, but now may be a good time to review your savings goals and adjust your strategy as needed. Once you receive your Welcome Package, you can allocate future contributions to the new investment menu. Note that participants no longer actively contributing to the plan will be issued a new contract for their Vanguard accumulations only. TIAA-CREF accumulations will remain where they are. 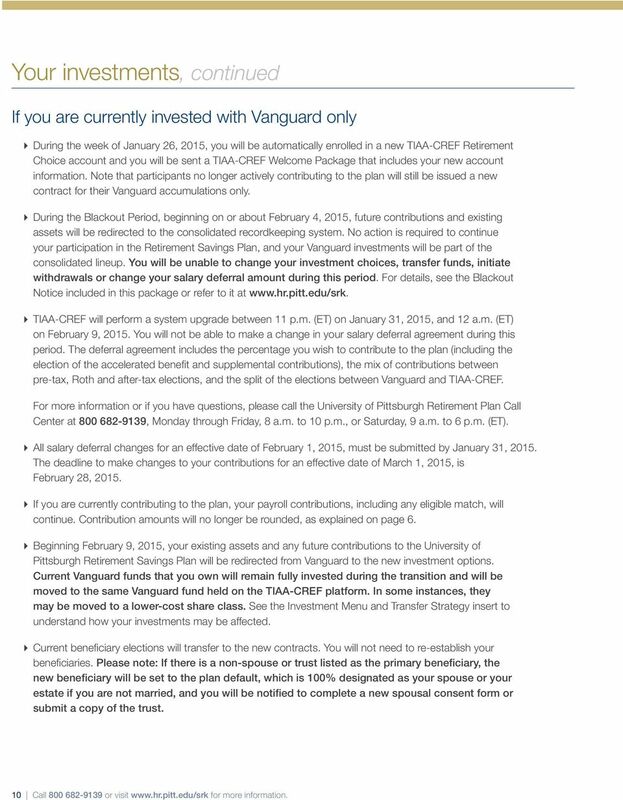 During the Blackout Period, beginning on or about February 4, 2015, you will be restricted from changing investment choices, transferring funds and initiating withdrawals on your Vanguard accounts. For details, see the Blackout Notice included in this package or refer to it at 12 Call or visit for more information. 14 Share class changes New, lower-cost share classes As previously mentioned, more than half of the TIAA-CREF and Vanguard investment assets will be offered at a lower cost to you once all investments are moved to the consolidated recordkeeping system. The affected investments are outlined on the enclosed Investment Menu and Transfer Strategy insert. What does a lower share class mean for me? Investing in a fund in a lower share class means that more of your money goes to purchasing investments, with less going toward fees. As a result, you keep a larger portion of the potential returns generated by each fund. While returns cannot be guaranteed, paying lower fees can help you reach your retirement goals faster. There is no investment strategy difference between the funds with different share classes. The mutual fund will charge different fees and expenses depending on the class offered to the plan. The new share class offers lower fees for these funds, thereby giving your portfolio more earnings potential. * *Lower expenses do not necessarily translate into higher returns. Are the new share classes of funds managed any differently than the ones I have now? Do they earn more or less? The principal difference between the classes is that the expenses of the new share class are less than the current share class. These savings can add up over time. The expense ratio is the annual fee that all funds or ETFs charge their shareholders. It expresses the percentage of assets deducted each fiscal year for fund expenses, including 12b-1 fees, management fees, administrative fees, operating costs and all other asset-based costs incurred by the fund. Portfolio transaction fees, or brokerage costs, as well as initial or deferred sales charges are not included in the expense ratio. The expense ratio, which is deducted from the fund s average net assets, is accrued on a daily basis. If the fund s assets are small, its expense ratio can be quite high because the fund must meet its expenses from a restricted asset base. Conversely, as the net assets of the fund grow, the expense percentage should ideally diminish as expenses are spread across the wider base. Funds may also opt to waive all or a portion of the expenses that make up their overall expense ratio. Are the new share classes actually a different fund than what I have now? No. A mutual fund may offer multiple share classes. Regardless of share class, each shareholder owns a proportionately determined amount or share of the fund s investment portfolio. Each share class has a unique ticker symbol and is registered with the Securities Exchange Commission (SEC) as separate share classes of the existing mutual funds. So, while the fund ticker will change, you are still investing in the same fund, just at a lower cost. 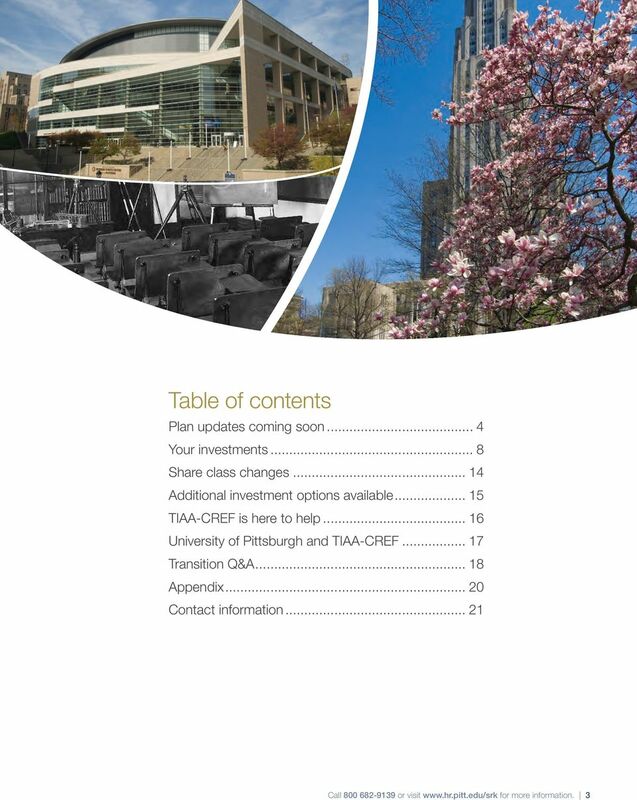 In 2015, the CREF Annuities will change its class structure, which will affect the CREF Accounts offered under the University of Pittsburgh plans. If you have a CREF Annuity, you will also receive an information package in early to mid-february concerning the new classes and your specific pricing. No action will be required regarding CREF. College Retirement Equities Fund or CREF was established in 1952 and introduced the first variable annuity. A variable annuity can provide lifetime income based on an investor s accumulated value, without the risk of running out of savings. Payments from variable annuities are not guaranteed, and the payment amounts may rise or fall depending on investment returns. 14 Call or visit for more information. 16 TIAA-CREF is here to help. Support for every step of your retirement journey Obtain personalized advice on the plan s investment options from TIAA-CREF and Vanguard. This service is available as part of your Retirement Savings Plan. TIAA-CREF can help tailor your portfolio to your individual needs using TIAA CREF and Vanguard investments, and is standing by to support you in building a strategy that can help you pursue your retirement savings goals. TIAA-CREF s investment advice takes the form of specific asset allocation recommendations on mutual funds and annuities, which is provided by Ibbotson Associates, Inc., an independent third-party asset allocation provider. Financial advice is designed to help you answer these important questions: Am I on track to reach my retirement savings goals? TIAA-CREF will help you analyze how your investments are performing and determine if you are saving enough to help meet your needs. Which combination of retirement plan investments is right for me? Obtain assistance picking the right investments, diversifying properly and allocating contributions to balance your need for growth potential with your tolerance for risk. How can I meet my income needs in retirement? Obtain help determining the amount you will need to meet your retirement income goals. 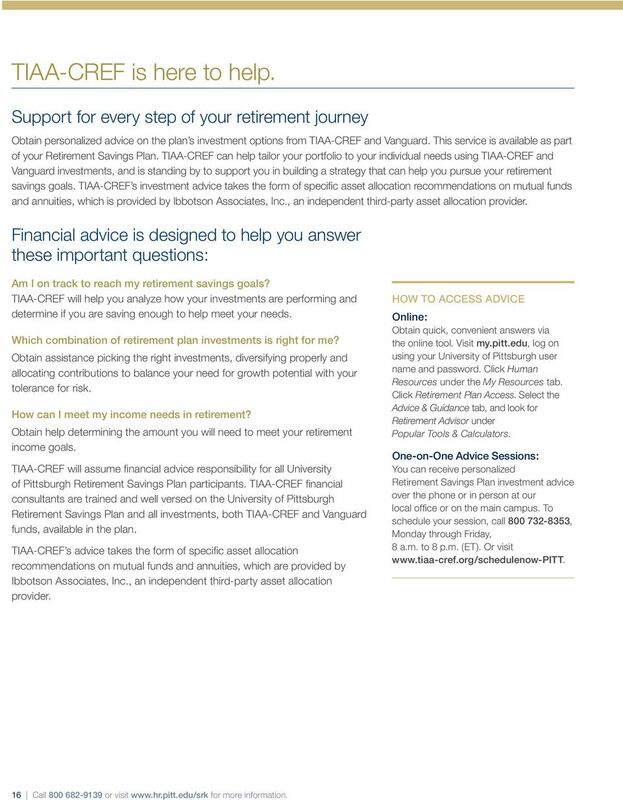 TIAA-CREF will assume financial advice responsibility for all University of Pittsburgh Retirement Savings Plan participants. TIAA CREF financial consultants are trained and well versed on the University of Pittsburgh Retirement Savings Plan and all investments, both TIAA-CREF and Vanguard funds, available in the plan. TIAA-CREF s advice takes the form of specific asset allocation recommendations on mutual funds and annuities, which are provided by Ibbotson Associates, Inc., an independent third-party asset allocation provider. HOW TO ACCESS ADVICE Online: Obtain quick, convenient answers via the online tool. Visit my.pitt.edu, log on using your University of Pittsburgh user name and password. Click Human Resources under the My Resources tab. Click Retirement Plan Access. Select the Advice & Guidance tab, and look for Retirement Advisor under Popular Tools & Calculators. One-on-One Advice Sessions: You can receive personalized Retirement Savings Plan investment advice over the phone or in person at our local office or on the main campus. To schedule your session, call , Monday through Friday, 8 a.m. to 8 p.m. (ET). Or visit 16 Call or visit for more information. 18 Transition Q&A 1. 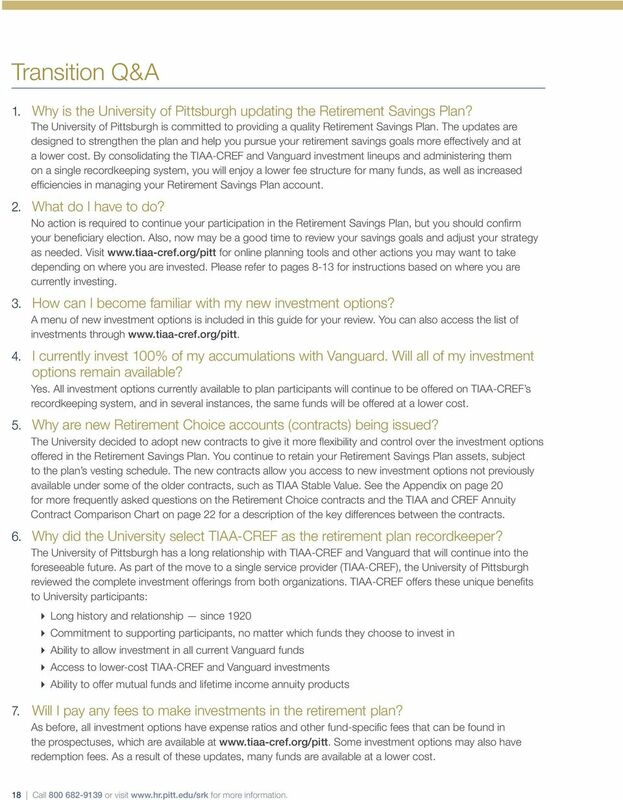 Why is the University of Pittsburgh updating the Retirement Savings Plan? 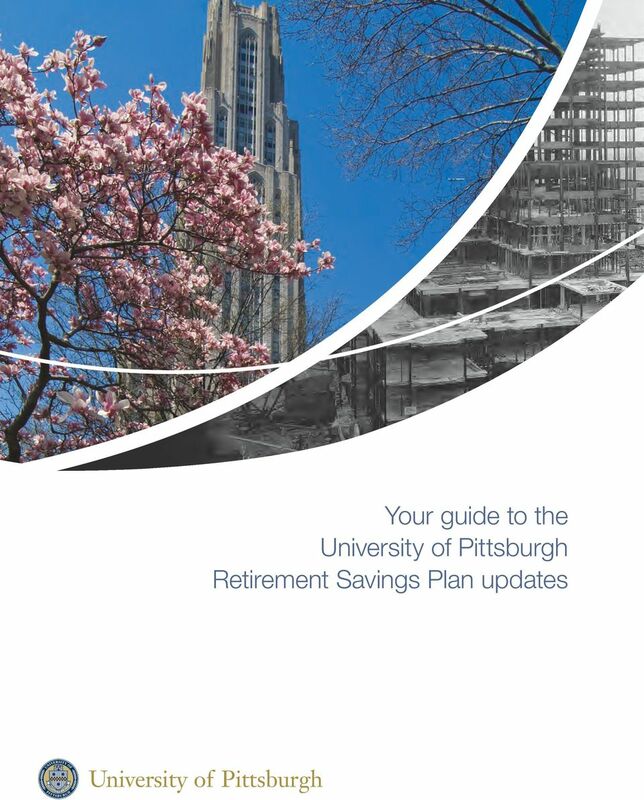 The University of Pittsburgh is committed to providing a quality Retirement Savings Plan. The updates are designed to strengthen the plan and help you pursue your retirement savings goals more effectively and at a lower cost. By consolidating the TIAA-CREF and Vanguard investment lineups and administering them on a single recordkeeping system, you will enjoy a lower fee structure for many funds, as well as increased efficiencies in managing your Retirement Savings Plan account. 2. What do I have to do? No action is required to continue your participation in the Retirement Savings Plan, but you should confirm your beneficiary election. Also, now may be a good time to review your savings goals and adjust your strategy as needed. Visit for online planning tools and other actions you may want to take depending on where you are invested. Please refer to pages 8-13 for instructions based on where you are currently investing. 3. How can I become familiar with my new investment options? A menu of new investment options is included in this guide for your review. You can also access the list of investments through 4. I currently invest 100% of my accumulations with Vanguard. Will all of my investment options remain available? Yes. All investment options currently available to plan participants will continue to be offered on TIAA-CREF s recordkeeping system, and in several instances, the same funds will be offered at a lower cost. 5. Why are new Retirement Choice accounts (contracts) being issued? The University decided to adopt new contracts to give it more flexibility and control over the investment options offered in the Retirement Savings Plan. You continue to retain your Retirement Savings Plan assets, subject to the plan s vesting schedule. The new contracts allow you access to new investment options not previously available under some of the older contracts, such as TIAA Stable Value. See the Appendix on page 20 for more frequently asked questions on the Retirement Choice contracts and the TIAA and CREF Annuity Contract Comparison Chart on page 22 for a description of the key differences between the contracts. 6. Why did the University select TIAA-CREF as the retirement plan recordkeeper? 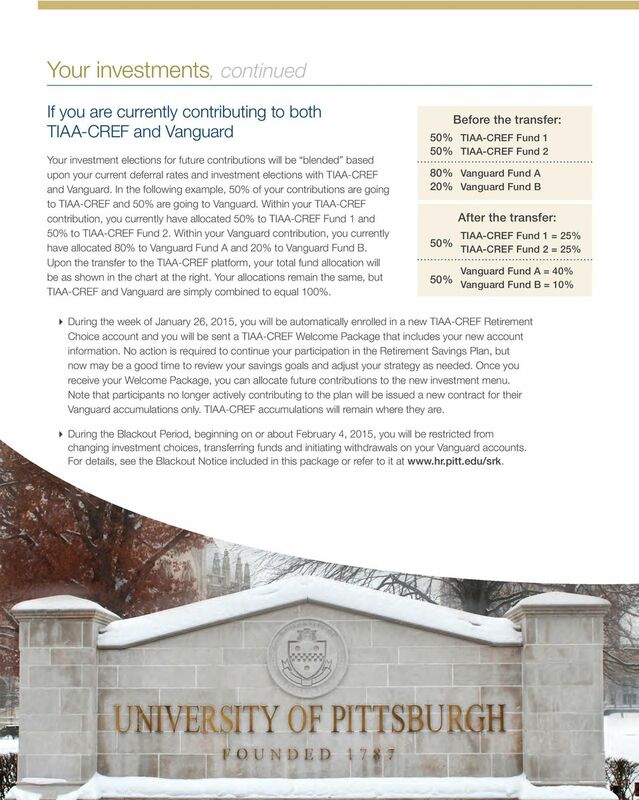 The University of Pittsburgh has a long relationship with TIAA-CREF and Vanguard that will continue into the foreseeable future. 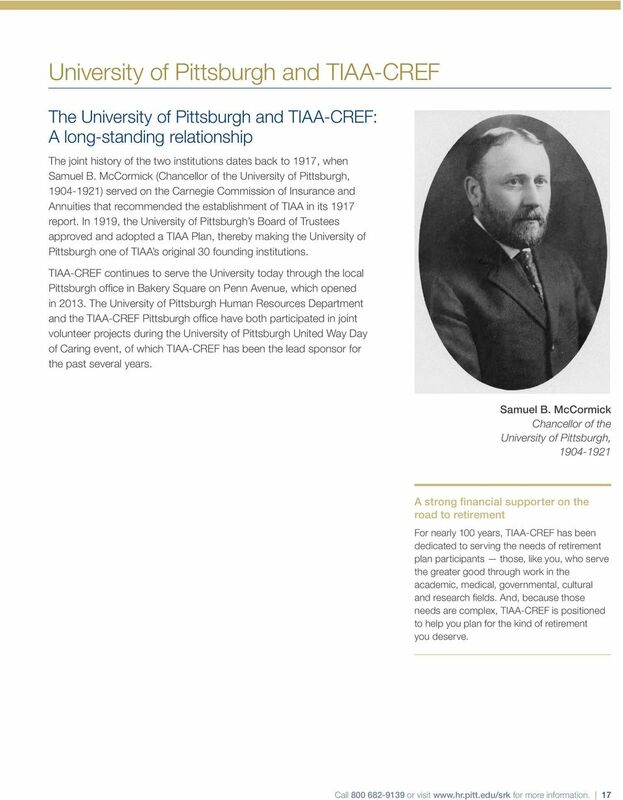 As part of the move to a single service provider (TIAA-CREF), the University of Pittsburgh reviewed the complete investment offerings from both organizations. TIAA-CREF offers these unique benefits to University participants: Long history and relationship since 1920 Commitment to supporting participants, no matter which funds they choose to invest in Ability to allow investment in all current Vanguard funds Access to lower-cost TIAA-CREF and Vanguard investments Ability to offer mutual funds and lifetime income annuity products 7. Will I pay any fees to make investments in the retirement plan? As before, all investment options have expense ratios and other fund-specific fees that can be found in the prospectuses, which are available at Some investment options may also have redemption fees. As a result of these updates, many funds are available at a lower cost. 18 Call or visit for more information. 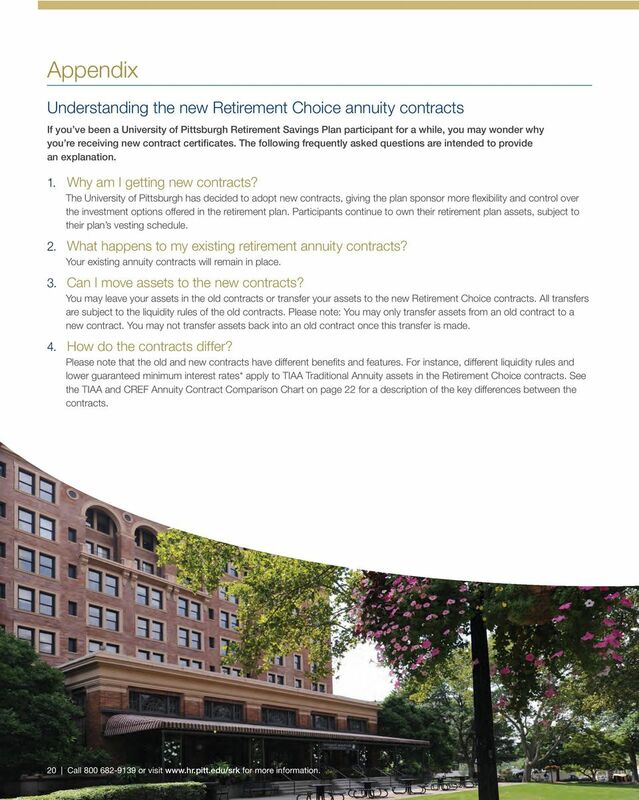 20 Appendix Understanding the new Retirement Choice annuity contracts If you ve been a University of Pittsburgh Retirement Savings Plan participant for a while, you may wonder why you re receiving new contract certificates. The following frequently asked questions are intended to provide an explanation. 1. Why am I getting new contracts? The University of Pittsburgh has decided to adopt new contracts, giving the plan sponsor more flexibility and control over the investment options offered in the retirement plan. Participants continue to own their retirement plan assets, subject to their plan s vesting schedule. 2. What happens to my existing retirement annuity contracts? Your existing annuity contracts will remain in place. 3. Can I move assets to the new contracts? You may leave your assets in the old contracts or transfer your assets to the new Retirement Choice contracts. All transfers are subject to the liquidity rules of the old contracts. Please note: You may only transfer assets from an old contract to a new contract. You may not transfer assets back into an old contract once this transfer is made. 4. How do the contracts differ? Please note that the old and new contracts have different benefits and features. For instance, different liquidity rules and lower guaranteed minimum interest rates* apply to TIAA Traditional Annuity assets in the Retirement Choice contracts. See the TIAA and CREF Annuity Contract Comparison Chart on page 22 for a description of the key differences between the contracts. 20 Call or visit for more information. 22 Appendix, continued TIAA and CREF Annuity Contract Comparison Chart Feature TIAA Traditional Annuity Guaranteed Minimum Rate (All guarantees are subject to TIAA s claims-paying ability.) TIAA Traditional Annuity Guaranteed Minimum Rate for payout annuities Transfers and Cash Withdrawals from TIAA Traditional Annuity Retirement Choice Annuity A rate between 1% and 3% is set by formula, under the terms of the contract, each calendar year for contributions, rollovers and transfers made between January 1 and December 31. This rate continues to be applied to this money for at least 10 years. The rate is based on the average five-year Constant Maturity Treasury Rate as reported by the Federal Reserve. Principal is always guaranteed. Opportunity for crediting of additional amounts in excess of the guaranteed rate. When declared, this rate remains in effect for the 12-month period beginning March 1. Additional amounts are not guaranteed for future years. 2% Made in 84 monthly payments. If plan permits, available in a lump sum within 120 days of terminating employment, subject to a 2.5% surrender charge. Retirement Annuity (RA) and Group Retirement Annuity (GRA) 3% for all contributions, rollovers and transfers Principal is always guaranteed. Opportunity for crediting of additional amounts in excess of the guaranteed rate. When declared, this rate remains in effect for the 12-month period beginning March 1. Additional amounts are not guaranteed for future years. 2.5% RA: Made in 10 annual installments over nine years and one day. Lump-sum withdrawals and transfers are not available. GRA: If the plan permits, available in a lump sum within 120 days of terminating employment, subject to a 2.5% surrender charge. Otherwise, made in 10 annual installments over nine years and one day. Supplemental Retirement Annuity (SRA) and Group Supplemental Retirement Annuity (GSRA) 3% for all contributions, rollovers and transfers Principal is always guaranteed. Opportunity for crediting of additional amounts in excess of the guaranteed rate. When declared, this rate remains in effect for the 12-month period beginning March 1. Additional amounts are not guaranteed for future years. 2.5% Available any time, subject to plan rules 22 Call or visit for more information. Wellesley College Retirement Plan Transition Guide. Inside is everything you need to know about the transition to the new Investment Menu. PERSI. It s Your Choice to Go Now, Go BIG! Plan Highlights. Learn about your PERSI Choice 401(k) Plan. Ready, Set, Go: the PERSI Base Plan. Retire from work, not life.. South Carolina Deferred Compensation Program Features and Highlights The South Carolina Deferred Compensation Program is a powerful tool to help you reach your retirement dreams. CBS & YOU PREPARE. DECIDE. ACT. Get help achieving your financial goals. Getting Started About the 401(k) plan. Who is eligible to enroll? What is a Roth 401(k) contribution? Why should I participate in the Program? Retire from work, not life..
401(k) Plan for your retirement and achieve your financial goals.